On October 15th and 16th, Dr. Yopie Prins, chair of the Comparative Literature department at the University of Michigan and former president of the American Comparative Literature Association, visited Rutgers and gave two talks on the history and current state of Translation Studies at UM. Dr. Yopie Prins developed her academic interest in translation studies from her Dutch-English bilingual experiences and studies at the University of Amsterdam, where she was influenced by James S. Holms’s book, The Name and Nature of Translation Studies. As chair of the Comparative Literature department at UM, she is committed to promoting critical translation studies at both the undergraduate and the graduate levels. Dr. Prins believes that translation moves not only between languages, but also between different media, disciplines, and cultures. Utilizing multilingual resources among students as well as faculty members, UM Comp Lit launched a translation semester to publicize translation on campus in 2012, with $20,000 in funding from the humanities dean’s office. The translation semester featured courses, lectures, as well as other translation-themed activities. During the semester, the department offered an undergraduate course—“22 Ways to Think about Translation”— which encouraged students to think about translation across disciplines and in their daily lives. Events that took place during the semester included a global Arabic poetry reading, a public screening of the film “Speaking in Tongues,” the staging of a performance play called “Translations,” and translation contests. 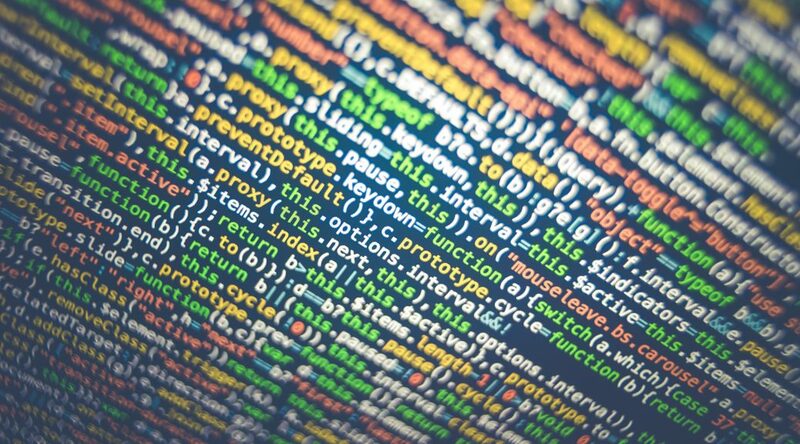 In order to make translation visible not only on campus and within language and literature departments, translation semester reached out beyond literary translation and included topics like machine, scientific, and professional translations. A panel titled “Words without Borders” invited students to discuss translation for a digital age, and a talk by Josh Estelle, lead developer of the Google Translate project and former graduate from UM, culminated in a translation competition between live translators and Google Translate. 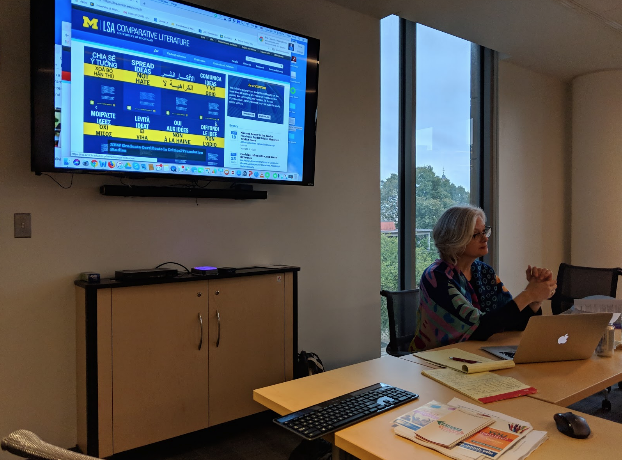 Collaborating with language programs and the Language Resource Center, Comp Lit at UM was able to carry out translation projects including the Language Bank, Translate-a-thon, and community translation services. While language programs brought the Language Bank into language classrooms, the Language Resource Center acted as a matchmaker to connect community organizations with student translation volunteers. The Translate-a-thon, a working group for collaborating translators from all departments across campus to meet weekly at Comp Lit, allowed translators to team up and work together to utilize their unique linguistic expertise. The Translate-a-thon at UM proved to be a great success; drawing both graduate and undergraduate students from different departments and disciplines, it grew from the initial 30–40 to over 200 regular participants in just a few years. It has also reached beyond the immediate community, through engaging international Fulbright scholars via Skype and maintaining a support team on an online forum. Following the successful translation semester, UM Comp Lit launched a Translation Studies minor in 2014. Open to students from all departments, the TS minor builds translation into the language department curricula and promotes more advanced level work in critical translation studies. Through required capstone projects, it promotes experiential and engaged learning and extends efforts of community outreach. According to TS minors, the program has provided them with not only relevant internship experiences but also a chance to reflect on their translation practices. Beyond the undergraduate level, UM Comp Lit also extends its initiatives in critical translation studies to the graduate level. Absinthe—a magazine published by the University of Michigan Press—provides the platform where graduate students propose thematic issues and publish their translations and critical reflections on translation. The magazine also gives interested graduate students a chance to develop professional skills in editing and networking with writers and publishers. UM Comp Lit also houses a graduate translation workshop centered around a translation club called “Cannon translation review”. Through these working groups and clubs, UM Comp Lit connects area studies departments to form intra-departmental and extra-departmental collaborations among graduate students through translation studies. Similar to the undergraduate minor in TS, a graduate certificate program in TS is offered. Moving forward, UM Comp Lit is experimenting with a post-doc position in critical translation studies and hopes to collaborate with their law school to develop TS projects on translation in the multilingual midwest and translation in and outside of universities. 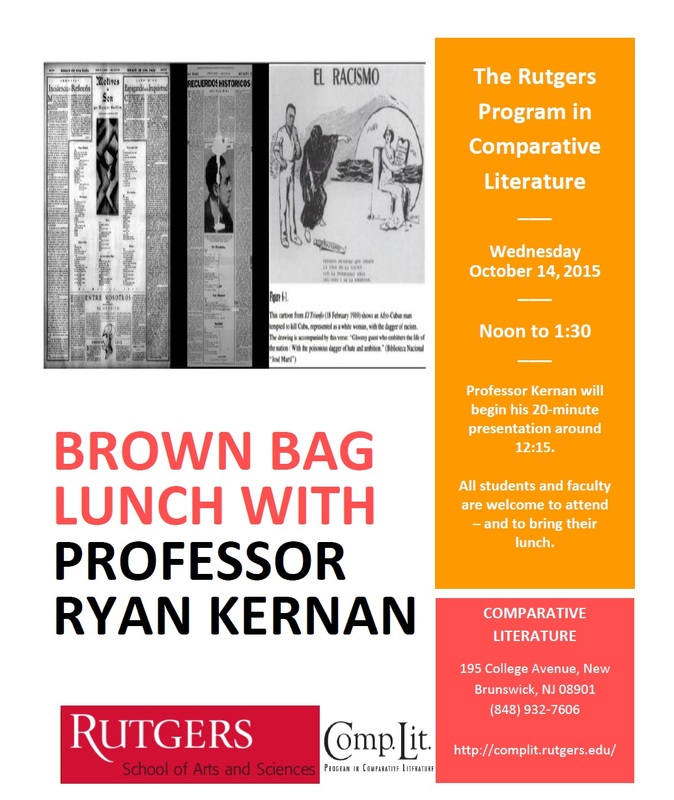 Dr. Prins’s talk drew faculty and students from all humanities departments at Rutgers. In the Q&A session, Prof Andrew Parker from the Comp Lit program at Rutgers pointed out that over 54% of the student population here at Rutgers speak a different language at home with their parents/grandparents. Learning from the successful experience of the critical translation studies initiatives at the UM, Rutgers humanities departments is also thinking about ways to address the multilingual backgrounds of our population and interests in critical translation studies here in New Jersey. 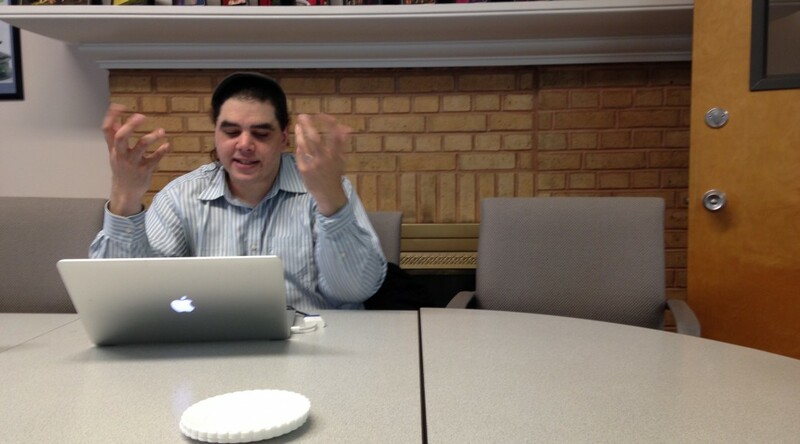 Working at the interstices of multilingualism and translation theory, fourth-year student Shawn Gonzalez presented at the final Comparative Literature potluck and colloquium held at 195 College Avenue. The topic—“Translating Linguistic Conflict in Two Multilingual Anthologies”—served as an immediate reminder of some of the big questions Comparative Literature works to address, and did so in a setting that reminded students and professors alike of their shared community and commitment to such issues. Working from theories of translation as put forth by Emily Apter and drawing from two collections of translated poetry—Multiples, edited by the English Adam Thirwell, and Paroles d’une Ile/Palabras de una Isla, edited by the Haitian Gahston Saint-Fleur and the Dominican Basilio Belliard—Shawn explored the contested relationship between comparativity and translation by considering questions of linguistic power. Thirwell’s collection, for example, invited translators of various skills to translate intralingual texts that were printed alongside each other. Shawn argued that Multiples—despite its claims to radicality—actually suppresses linguistic conflict and avoids addressing imbalanced linguistic power relations. Paroles d’une Ile/Palabras de una Isla, on the other hand, in featuring Haitian poems translated into Spanish and Dominican poems translated into French side-by-side on the page, visibly engages the political conflicts between Dominican Republic and Haiti. In Paroles/Palabras, Shawn argued, Belliard and Saint-Fleur allow for and encourage an analysis of power relations that is historically and spatially grounded. Using the poet Jacques Viau Renaud, a poet born in Port-au-Prince who later moved to the Dominican Republic and claims both locations as his homeland, as a fulcrum around which to destabilize the division between two monolingual audiences, Shawn was able to grapple with the tensions between translation theory and decoloniality. The evening ended with a discussion of engaging with a new paradigm for translation that’s collaborative by necessity, not just as an aesthetic choice. 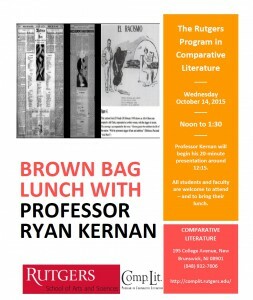 On Wednesday October 14, Ryan Kernan, Assistant Professor of English and Affiliate Faculty in Comparative Literature, presented his research at a Brown Bag lunch. Professor Kernan approached the recurring question of the relationship between Langston Hughes and Nicolás Guillén through the figure of Cuban writer, translator, and political activist José Antonio Fernández de Castro. By focusing on Fernández de Castro, Kernan argued for a comparative reading that does not fetishize difference by promoting untranslatability but rather uses intertextuality to read the political resonances of translated texts. The presentation began with a reading of a political cartoon that established the terms of racial debate in Cuba in the period before Hughes’ Spanish translations. Then, Kernan focused on Fernández de Castro’s pseudonymous translation of Hughes’ “Brass Spittoons.” Kernan close read the poem in English and Spanish translation in order to identify the places where Fernández de Castro deliberately chose words that diverged from Hughes’ version in order to recast the poem with an explicitly proletariat political orientation. By considering the importance of Fernández de Castro’s work on this translation as well as his larger orchestration of the poetic relationship between Guillén and Hughes, Kernan’s comparative reading traces the way that black internationalism was formulated in a specific local context. Kernan argued that when critics claim that something is untranslatable or incomparable, this claim often reveals a lack of imagination. In contrast, his reading of the differences that emerge in Hughes’ Spanish translations offer fertile sites of comparative work on black internationalism.